Cardinal Richelieu founded the French Academy in 1635. Transported, on March 20th, 1805, at the College of Four Nations on decree of Bonaparte, it becomes the Dome and the illustrious institute will jealously keep the secret of its longevity. We made an appointment at the Quai de Conti with deep literature. Daniel Oster, graduate of Arts, writer and project manager for the publication of the dictionary, was waiting for us for an exclusive tour of these sacred places. Until the creation of the Academy, the man of letters encountered difficulties to subsist by his trade. Copyright did not exist at the time. The writer was related to a noble to whom he was either the counselor or the scribe or the historian as Racine for the king. Corneille, was earning more money with the theater. The manuscripts were sold to the bookseller. Being a member of the Academy was therefore a livelihood. «If the Academy was created thanks to the Pleiades, Ronsard and political will.» Isn’t King Louis XIII who in 1635, formalizes the Academy? This assembly of scholars whom discussions devoted exclusively to the letters showed the link between the status of a man of letters and the politician distributing gratuities. MISSION OF AUTHORITY. This does not explain that beyond time, the Academy still shines at the height of the literature. Daniel Oster: «Caring for the French language, that’s why it was founded. I mean by that defender of the language of a people, a nation. Deliberation and meeting rooms. Marguerite Yourcenar was elected Academician in 1980 becoming the first woman, to serve in the Institute reserved for men. He added: «But all is prior to the Academy. There had already been the Pleiades. France, its literature already existed. The Pleiades was the precursor, the vanguard, having charge of the soul of the language. And the Academy came somehow to achieve this mission of authority. At that time were grafted, as now, the problems of a language that lacked coherence, consistency. Archaic and new words were adjacent to each other. The spelling was non-existent; then you understand that the Academy remained. The reasons why it was created are always the same. Like it or not, language is constituted around foundations. The base: literature with headlights authors were not only Proust, Rabelais, or others … It is not surprising that we have given to scholars the task of unifying the language in the name of the nation. The man of letters had to stay away from both language specialists, grammarians and linguists, while referring to them, and away from those who were using either the Court and the people. Hence the need to collect, sort, center. This need remains however with the difference between spoken and written French. In the XVIIth century, order reigned: they had established a discipline: when to use the noble words, when it is tolerated to be more familiar. .. The dictionary of the Academy remained quite firm on the matter.» Inside the language, levels, data have been set. Since its first edition, the Academy’s dictionary is defined as a common language dictionary containing a minimum of 50,000 to 55,000 words. If all French and Francophone employed wisely 55,000 words, it would be surprising. «The situation at this level is now more consistent then in the XVIIth century,» Daniel Oster tells me. The architect Le Van had drawn a building on the theme of St. Peter’s of Rome. The front half moon evokes a minor key, the Vatican Bernini’s colonnade. The dome that surmounts the Cross Chapel soars above the facade. The State and establishes its Sacred College of Reason in a setting and under an arch rivaling those of the Basilica of the Roman Pontiffs. NAPOLEON UNDER THE DOME. «At first, the Academy met at the home of one member or another. In 1639, it was greeted with Seguier Chancellor; in 1672, installed in the Louvre by Colbert. It was only by decree of Napoleon that it was settled permanently in August 1806 at the College of the Four Nations, built with funds bequeathed by Mazarin. Its chapel was now called the Dome. 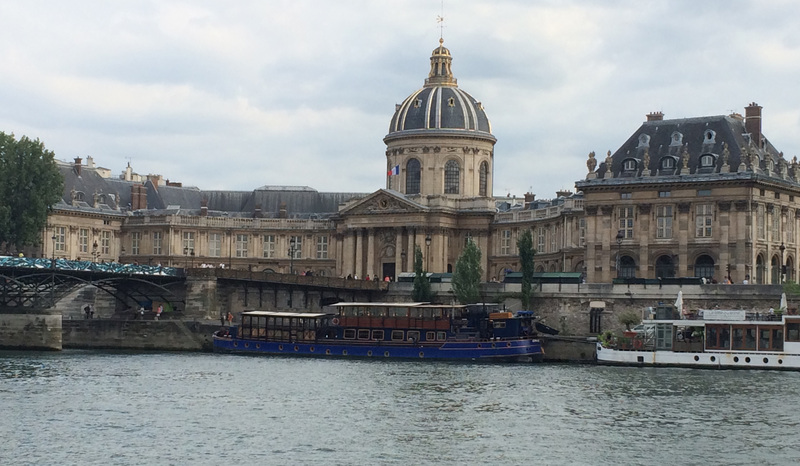 By transporting the Institute on the other side of the Seine, Napoleon had wanted to give it a new sublimity. His choice could not be more appropriate» … Today, in the XXth century, the Academy is still administered by a permanent secretary, elected for life, now, Maurice Druon, who visited Lebanon. And imperturbable Dome continues to host prestigious Immortals: writers and scientists.